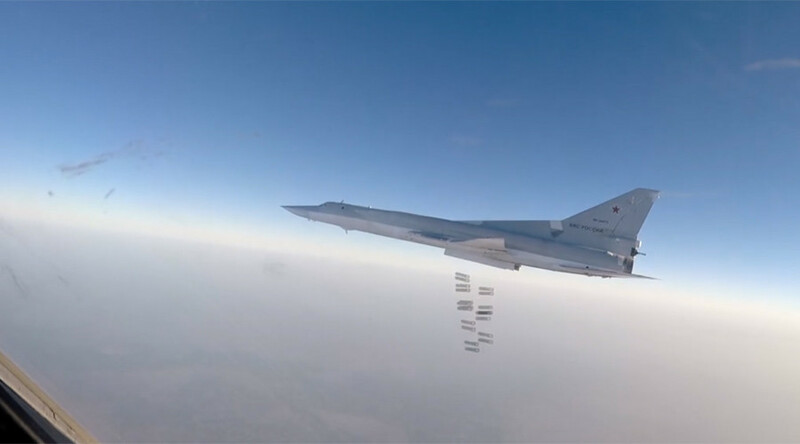 Russian Tu-22M3 strategic bombers have destroyed an Islamic State chemical weapons factory and killed numerous personnel with concentrated high-explosive munitions airstrikes around the terrorist stronghold Raqqa in Syria. Six long-range Tu-22M3s (NATO reporting name: Blinder) took off from airfields in Russia and, having passed through the airspace of several countries, attacked Islamic State (IS, formerly ISIS/ISIL) terrorist installations southeast, north, and northwest of the city of Raqqa. The bombers were escorted by Sukhoi Su-35C fighter jets and Su-30SM fighter-bomber jets that took off from Khmeimim airbase in Syria’s Latakia province. All of the aircraft successfully returned to their respective bases. The bombers carried out devastating airstrikes in several locations, eliminating a plant producing chemical munitions in a northwestern suburb of Raqqa, as well as a large warehouse containing weapons, munitions and fuel close to the city, and a large Islamic State (IS, formerly ISIS/ISIL) field training camp. The airstrikes inflicted multiple casualties on the terrorist forces, Russia’s Defense Ministry reports, citing drone surveillance. On Monday, August 8, long-range Russian bombers destroyed IS targets near Palmyra, Syria. Six Tu-22M3s carried out airstrikes near the settlements of Es Sukhne and Arak, eliminating a terrorist control center, an underground munitions and weaponry dump, fighting infantry vehicles, and off-roaders mounted with heavy machine guns, along with a large number of enemy personnel.